One example from the third group is provided by a carte de visite in the collection of John Bradley, an image of which he sent me recently. It is a full length portrait of a young mean seated in a studio setting which is fairly standard fare for the mid- to late 1860s or early 1870s. The reverse of the card mount has a design consisting of a coat of arms and lines of text in several different fonts, typical of the mid-to late 1860s. The photographer was, "H. Lord, St Peter's Street, Huddersfield and Spring Gardens, Buxton." Henry Lord (1815-1887) was an established Huddersfield photographer who was originally a painter, but set up a studio in St Peter's Street in the late 1850s. He continued to operate in Huddersfield at least until the 1880s, and died there in 1887. His third son Ralph Herbert Lord was an assistant in the studio as a teenager, but after his marriage in 1878, he settled in Chesterton, Cambridgeshire, where he opened his own photographic business. Roger Vaughan has a carte de visite of an unidentified couple by Henry Lord of St Peter's Street, Huddersfield on his web site, probably taken in the early to mid-1870s. The reverse does not list the Buxton branch, so it was presumably short-lived. Thus far, I have been unable to find any other documentary evidence of Lord's visit (or visits) to Buxton. Buxton was a tourist town, even then, and a huge industry had grown up around catering for the many summer visitors to the mineral springs. Spring Gardens is shown by a later post card and trade directories of the period as a row of four-storey buildings with many lodging houses. I suspect that Henry Lord would rent a room there during his visits to Buxton, presumably designed to look for business at the peak of the holiday season, when many of his more affluent Huddersfield clientele would presumably be out of town. Although it is possible that further sightings of Henry Lord in Buxton may be discovered in due course - indeed, that is part of the reason for my writing this article on Photo-Sleuth - addresses printed on the reverse of card mounts may subsequently prove to be the only evidence of their presence in a particular location. The Chesterfield firm of Seaman & Sons was started by Alfred Seaman (1844-1910) around 1876, and by the early to mid-1880s his sons were joining him in the business. Many members of the Seaman family eventually entered the photographic profession - indeed, there is a descendant still operating in Chesterfield to this day - but it is Alfred's fourth son Frederick Joseph Seaman (1874-1953) who will be the focus of this article. This fine portrait from the collection of Joe Seaman's grand-daughter, Anne Williams, shows the four brothers, sons of Alfred by his first wife Elizabeth Dennis (1844-1874), taken in the early 1890s, presumably taken by their father Alfred, shortly after Joe had entered the business. All four of them are shown together in the 1891 Census (see image below), living at 49 Durrant Road, Chesterfield. During the late 1880s and 1890s, the firm opened new branches in Ilkeston (by 1887), Alfreton (by 1895), Sheffield and Leeds (by 1899), and it seems likely that the sons played a major part in running these branches. By 1897, however, F.J. Seaman was working from a new studio - not part of the Seaman & Sons chain - at 2 High Street, Hucknall Torkard, north of Nottingham. The cabinet card portrait of him shown above has the Hucknall premises printed on the mount. In the same year (1897) he married Bertha Beatrice Thorpe at Basford, Nottinghamshire. The cabinet photo above, probably taken around 1897-1898, and possibly also by Alfred, since it is mounted on a Seaman & Sons card, shows Joe and Bertha with an older brother and sister-in-law. At the end of March 1901 (see census image above), they were living at 2 South Street, Rushcliffe, Nottinghamshire with their three month-old baby Mable [sic]. He described himself as a "photographer & picture frame maker" working from home. According to Heathcote & Heathcote the Hucknall studio remained open until 1903. During some of this period, i.e. 1897 to 1903, he also operated a studio across the county border in nearby Heanor (Derbyshire). The above photograph of an unidentified young woman was sent to me by Malcolm Dabell. It is a standard cabinet card with rounded corners, with an art nouveau design which is typical of the late 1890s and early 1900s. Merely from the style of clothing worn by the subject, I would have suggested that it was taken some time between 1895 and 1898. The enormous "leg of mutton"-style sleeves which are partly visible in the vignetted portraited were characteristic of the mid- to late 1890s. However, as both the Hucknall and Heanor studios are shown, the possible dates can be narrowed down to c. 1897-1898. This cabinet card portrait of an unidentified young child belongs to Lies Ligthart, to whom I am most grateful for permission to reproduce it here. The style of clothing, elaborate wicker chair and potted aspidistra used as studio props, and art nouveau-style design on the card mount all point to a date of the early 1900s for this portrait, say between 1900 and 1903. Adamson (1997) states that F.J. Seaman had a studio in the Red Lion Square, Heanor in 1905 and 1906. His obituary stated that, "after six years at Hucknall he moved to Hull, where he started a business and within a short period had branch establishments at York, Beverley and Scarborough." Other sources state that he was operating a studio at Davygate, York between 1909 and 1912. "In 1907 he went to Blackpool, where he carried on a photographer's business for 17 years, and for a short period before he came back to Chesterfield in 1926 he was in business at Doncaster ... The business he established at Scarborough was taken over by his brother, the late Mr. Alfred Seaman, and subsequently by Mr. A. Seaman's son.." The Exhibition Study Group web site lists postcards dated c. 1908 which suggest that he was then operating primarily from Hull and York, but had branches in Beverley, Darlington, Blackpool, Scarborough and Bridlington. This vignetted postcard portrait of a young girl, identified on the reverse only as "Rita," is from my own collection. It was taken at the Doncaster branch studio, as evidenced by the studio name blind-stamped in the lower right-hand corner. It was possibly taken shortly after the Great War or in the early 1920s. Certainly he was in Doncaster by 1922. Blind stamped, "F.J. Seaman & Sons"
Upon returning to Chesterfield in 1926, he took over the premises in Irongate, "and carried on business there up to his retirement in 1950, when his son, Mr. Stanley Seaman, took over the business." Frederick Joseph Seaman died at St. Margaret's Hotel, Torquay on 26 March 1953, at the age of 79. Many thanks to F.J. Seaman's grand-daughter Anne Williams for several images of the Seaman family and a wealth of information. I am grateful also to John Bradley for images and a continuing interest in my projects, and to Malcolm Dabell and Lies Ligthart for images of photographs in their collections. Adamson, Keith I.P. (1997) Professional Photographers in Derbyshire 1843-1914, Supplement No. 118 to The PhotoHistorian, September 1997, ISSN 0957-0209. Heathcote B. & Heathcote, P. (n.d.) Pioneers of Photography in Nottinghamshire, Nottinghamshire County Council, ISBN 0 902751 38 7. Death of Mr F J Seaman, Unidentified newspaper cutting, dated 2 April 1953, courtesy of Anne Williams. The indefatigable Cynthia Maddock also sent me these scans of another postcard portrait, which are of her friend's mother as a child, holding a doll. She was Harriet Elizabeth Barker, born at Snelston near Ashbourne on 23rd November 1908. Her parents were Robert and Ellen Elizabeth Barker. She earned her living in domestic service in Derby until her marriage. In later life she lived in Loughborough and died in 1998 aged 89 years. If she was between three and four years old when she visited the studio for this portrait, it was probably taken in 1912. The portrait was taken by the firm of Robert Bull and his nephew, another Robert Bull, trading as R. & R. Bull of Ashbourne. The "A half-penny stamp for inland one penny foreign" postage rate specified in the stamp box was standard in the United Kingdom until 1918 (Source: Peter Stubbs' EdinPhotos Post Card History). This postcard portrait, also sent to me by Cynthia Maddock, posed a few identification problems for her. However, after an equiry through an article in the Derby Evening Telegraph's 'Bygones' section, reproduced on This is Derbyshire here, Derby author Anton Rippon came up with the information that it was Arthur Latham, a former Derby County player in the early days of the club. He was one of the club's early players when they joined the Football League in 1888 and became trainer when he finished playing in 1891. He was the England trainer on several occasions. He died in Derby, in November 1929. One of the first ["men of the magic sponge"] at Derby County was Arthur Latham, who played right-back for the Rams in their early Football League days. By the mid-1890s, he had become the trainer and continued in the role until 1919. That was typical, for while players and managers come and go at an alarming rate, a trainer often stays with one club for many years. Arthur Latham was born in 1863 at Coventry in Warwickshire, the second child of a silk weaver Thomas Latham and his wife Ann Fleeman. Shortly after he was born, the family moved to Derby, where they settled in St Werburgh's parish. By the time Arthur was eighteen, he was working with his father as a house painter and decorator, a profession in which he continued for most of his life. In 1887, he married Harriet Ann Adcock at Derby, and they were to have at least five children (four daughters and a son). The County made a draw 1 to 1 but had the best of the game. Blackburn scored from a penalty kick. - Mrs. B. all right. J.H.S. 7/9/12. The front of the postcard portrait has the studio name, "Treble, Derby," in white at the lower left, indicating that it was printed by hand on the negative. Edward Montague Treble had a studio on East Street, Derby from around 1912 until at least the late 1920s. This carte de visite is from the collection of Cynthia Maddock, a fellow collector of old photographs by Derbyshire photographers who very kindly shares images from her collection with me and, by extension, readers of both Photo-Sleuth and my other site, Derbyshire Photographers. The image shows a group of people, presumably members of a family, arranged rather haphazardly in the garden in front of a house. The house itself is double-storey, contructed of dressed stone, with chimneys at each gabled end, and a thatched roof. Four large windows are visible, the upper two with visible curtains, each with numerous small panes. A smaller building with a tiled roof, also with a multi-paned window is partially visible at the left. In front of the group is a pole set vertically in the ground, perhaps three metres high, with a string or thin rope tied near the top and extending towards and to the left of the photographer, possibly a washing line. The tiled roofs of other buildings situated behind the main house are just visible immediately to the left and right of the photo. I believe this must be the back garden of the house, rather than the main frontage which faces the road. There are several bushes visible in the foreground, but also what appears to be some sort of stone platform. On top of this platform are a large dish, a bucket, a jar, a smaller dish and, I think, a cat! There appears to be a pipe sticking out of the left-hand side of the platform, which causes me to wonder if it is some kind of washing area. - a middle-aged man, standing behind the stone platform, and leaning with both forearms on the platform. There is no indication from an inscription or any other history attached to the photo who the subjects were. However, my initial guess would be that they are, from left to right, maiden aunt, grandmother, child, grandfather, mother with child, maiden aunt and father. I estimate from the style of the dresses of the younger three women, together with the fact their ears are just visible from beneath their tightly drawn back and centre-parted hair, that the photograph was probably taken in the mid- to late 1860s, say between 1865 and 1869. The photographer, as evidenced from the backstamp on the card mount, was Thomas Barker Mellor of Nottingham Road, Belper in Derbyshire. Adamson (1997) mentions only that Mellor was operating from The Butts in Belper around 1874, presumably taken from an entry in Wright's trade directory of that date, which also described him as a music teacher. However, it is clear from the entry in the 1871 Census, in which he described himself as a photographer, and the existence of several cartes de visite from the late 1860s, that he was working in the profession prior to that date. Thomas B. Mellor was born at Belper in 1849, one of the large family of draper John Mellor (1812-1900) and his second wife Jane Barker. It seems unlikely that he would have worked as a photographer with his own printed card mounts prior to the age of about eighteen, and the earliest date for a photograph by him on a printed mount is therefore likely to be c. 1867. He married Mary Ann Allsop at Belper in 1874 and they moved to Bakewell in about 1877. Mellor appears to have ceased working as a photographer at this time, being listed as an "organist and teacher of music" in both the 1881 and 1891 censuses. He appears, therefore, to have been working as a photographer for about a decade, from c. 1867 until c. 1877. Thomas Mellor died in 1915. - Harrod, J.G. & Co. (1870) Postal & Commercial Directory of Derbyshire, Leicestershire, Rutland & Staffordshire. - Wright, C.N. (1874) Directory of South Derbyshire, Third Edition, October 1874. - Kelly (1881) Directory of Derbyshire. Diana Burns sent me images of three cartes de visite by The Trafalgar Photographic Company. They show her great-grandfather Daniel Talbot (b. 1848) and possibly his cousin, the manager of the company, James Denham Wise (b. 1842) with his wife, and their son James (b. 1869). She wondered, "if the low number of the negative shown on the back was a clue to the company having just opened, with relatives and friends coming in as customers?" I think Diana is quite right in her assumption that the low negative numbers on the photographs are an indication that they were taken at a very early stage in the studio's life. It is not clear to me from my own research who the photographer was at the Trafalgar Photographic Company, but I suspect that James Denham Wise was the business manager, and may not have taken any of the photos himself. In the 1871 and 1881 censuses he described himself respectively as "Manager Fine Art Dept." and "Agent & Commercial Traveller Hardware Provisions & Fancy Goods." I found somewhat conflicting information about the dates of operation of the Trafalgar Photographic Company. The photoLondon database shows the business succeeding the tenure of Frederick Pipere (1823-1873) at 37 Chandos Street, St Martin's Lane, Westminster and operating from 1872 until 1873, subsequently being taken over by Frederick Pipere's widow Sarah Ann Pipere (1823 - 1909), who was there from 1873 to 1885, and operated for some of that time as the Charing Cross School of Photography. Another entry in the same database states that the studio was at 37 Chandos St, Covent Garden W.C. from 1874 to 1875. Frederick Pipere died in the second quarter of 1873, and it seems likely that James Denham Wise took over the proprietorship of the premises at 37 Chandos Street, Westminster, near Covent Garden at around the time of Pipere's death. However, as Pipere may have been unwell for a while prior to his actual decease, it would be dangerous to assume that the Trafalgar Photographic Company only commenced after his death. The suggestion, however, is that the tenure of the Trafalgar Photographic Co. may have been of fairly brief duration. Two of Diana's three photos have negative numbers (8 and 30) which are amongst the lowest that I've seen. The third photo (James Wise junior) doesn't have one at all, which doesn't surprise me - many studios used them irregularly, or not at all - but I still think that it would have been taken at around the same time, possibly during the same sitting, as the portrait of his parents, James Denham & Lucy Wise (neg #8), which used the same chair. Bearing in mind my deductions on the period of operation of the studio, I would suggest that all three photos were taken either in 1872 or 1873. If James Denham Wise junior was born in late 1868 or early 1869 (from FreeBMD), then he would have been about four or five years old, which seems about right. It would be natural for them to use family and friends for subjects while they were still practicising, and building up a clientele. They may even have used such portraits to advertise the business. The card mounts have square corners, while the design on the reverse is typical of the early to mid-1870s. Now to the identity of the photographer. I noticed that living two doors down from James Denham Wise and his family in the 1871 Census, at 127 Lancaster Road, was a photographer of Danish origin, Lauretz Dietrichson. The photoLondon database shows him operating a studio at 63 Westbourne Grove, Bayswater, Paddington in 1871 and 1872. I wonder if he subsequently worked for the Trafalgar Photographic Co. for a couple of years? There's no way for us to know, without further information, but it is a possibility. Hilary Booth sent me this charming portrait of family member Florrie Swann, taken by Derby photographer Frederick J. Boyes. Hilary writes: "Florence Swann's mother Harriet Clark was Mary Clark née Porter's first child. We have traced Harriet on the census records until 1901 when she was working at a lunatic asylum in Bristol, unmarried. We have found a marriage record in 1908, so we think Florence Swann was born around 1910? She had a sibling Leslie who was born about 1912. Hopefully we may be able to be more accurate when the next census record is released. The cabinet card mount is one of Boyes' most common standard designs, used from 1893 until the early to mid-1900s. One interesting feature of Boyes' cabinet card and carte de visite portraits is that he stamped almost all of them with the negative number. Although my portfolio of Boyes portraits is still fairly small, and I only have a few which are accurately dated, this has given me some idea of his output. Boyes was a particularly accomplished photographer who, although he had a fairly late start in Derby c. 1886, quickly established an excellent reputation for fine quality portraiture. I estimate that by the turn of the century he was taking between 60 and 100 portraits a month (or 2-4 sittings a day). This was, of course, nothing like the 450-500 sittings per month being achieved by W.W. Winter in Midland Road at this time, but then Winter had been much longer established, and was situated in a very favourable location, close to the Derby railway station. A simple graph of the negative numbers plotted against the estimated or actual date of the portraits in my collection of images shows a fairly good trend (see above). If this trend is then extrapolated forwards, we can estimate an approximate date of c. March-May 1904 for Hilary's portrait with a negative number of 20025. Although I am less confident of this estimate than I might have been for one in the date range 1891-1901, since I don't have any dated F.J. Boyes portraits with negative numbers from after 1901, it at least gives us an idea of when it might have been taken. It is odd that my estimate is some seven years earlier than might be expected from Hilary's guess of a birth date for Florrie of around 1910. Hilary also sent me this postcard portrait of a slightly older Florrie Swann with her younger brother Leslie. There is a definite likeness. Unfortunately, there is little on this portrait to provide an accurate date either, but I estimate it was taken in the early 1910s, say between 1910 and 1914. I received this image of an ambrotype, or collodion positive, recently from Nino Manci, who purchased it in Buxton, Derbyshire. Apart from a little damage to the emulsion of the original, presumably from abrasion, it is a very nice picture. I should point out that I have carried out some minor digital manipulation of the image - mainly adjustment of the contrast, with no other editing of the picture - as the original was very dark. Although it is no longer housed in the case in which it was likely to have been originally sold, it does still have the ornate pinchbeck frame in relatively decent condition. Pinchbeck, now synonymous with things cheap and tawdry, was a gold-coloured copper-zinc alloy developed in the 1700s by English watchmaker, Christopher Pinchbeck [Source: World Wide Words], that became a popular choice for cheap frames (I think matts in US parlance). On the reverse of the ambrotype is the inscription, "Wallis Ironmongers, Nr Post Office, Bakewell." The picture shows a shopfront and, in Nino's words, "I presume Mr Wallis at the door of his establishment with the sign 'Furnishing Ironmongers' above him. The shop seems to sell a wide range of household and farming products." The first interesting thing to note is Nino's statement that the photo was probably taken from the mid-1880s to the 1890s. Ambrotypes became very popular, and indeed the most common type of photograph used for portraits, in the mid- to late 1850s, but were still common in the early 1860s, before being rapidly superseded by the carte de visite. However, they were still used occasionally, mainly because of their cheapness, for example by travelling photographers, and enjoyed brief resurgences in popularity from time to time. The firm Wallis Ironmongers of Bakewell appears to have been fairly long-lived. John, William and Edwin Wallis were three sons of a Bakewell lodging house keeper, William Wallis (c1790-1844) and his wife Mary Lees. Slater (1850) lists the middle son William Wallis (1824-) as a brazier and tinman with a shop on Bridge Street, Bakewell, although the census a year later indicates that they lived with their widowed mother in Water Lane. John and Edwin Wallis were working as carriers in 1851, and John had become an earthenware dealer in 1855 (Anon). By 1857 (White), John had married and opened an ironmongery and glass & china dealers on Bridge Street, and three years later (Harrison, 1860) Edwin was a smallware dealer around the corner in Bath Street. Their mother Mary Wallis died shortly after the 1861 census, and Edwin Wallis married Ann Kitson (c1838-18 at Bakewell on 22 May 1864. Ann gave birth to twins, a boy and a girl, early the following year, but sadly Ann and the boy died soon after. Edwin remarried on 2 August 1866 to Sarah Susannah Bower (c.1837-1919). By the time the 1870 edition of Harrod & Co.'s trade directory was compiled, Edwin was operating as a general dealer and ironmonger at Anchor square, Bakewell, while John and his wife had vanished from the scene. The 1871 Census shows them to be doing sufficient business by then to be employing a shop assistant and a general servant. By 1881 (Census & Kelly) Edwin & Sarah Wallis were living in Bath Street and operating what was referred to as an ironmongery and general dealership in Bridge Street. Edwin died in late 1883, at the age of 51, leaving a widow and five children, the eldest Mary Ann being sixteen and the youngest only three years old. However, Sarah continued to run the shop, and was listed in the 1887, 1891, 1895 and 1899 trade directories. Her children Lucy and Charles Wallis became shop assistants by 1891, and continued to assist her until at least 1901. Sarah Wallis died in 1919. What may be of interest to you is that just inside the window, to the right of Mr Wallis is a separate display cabinet displaying photographs. The scan is not as crisp as under a magnifying glass. At the top of the case are the words Seaman and Sons Photographers. The cabinet appears to be full of scenic views of Derbyshire. Many firms, such as Francis Frith made a good living from the sale of such images, and this shows how Mr Seaman also adventured into selling his firm's images though other outlets. From my study of the photographic firm, it appears they only started trading as Seaman & Sons in the mid-1880s. The founder of the business, Alfred Seaman (1844-1910), opened his first studio in Chesterfield in around 1876. Although his second son Albert Edward was already working as an photographic assistant in the studio in 1881, he was only fifteen years old, and it would have been normal that the firm would only have started trading with the suffix "& Sons" when the sons reached the age of eighteen. Indeed, it is not until the 1887 edition of Kelly's trade directory that the listing is formally shown as A. Seaman & Sons. It seems unlikely that the man - perhaps in his late 20s or early 30s - standing in front of the shop is Edwin Wallis, as he died in late 1883. I assume, therefore, that he is an assistant hired by Sarah Wallis. Charles Wallis was 25 years old by 1901, so there is a possibility it is him, if the photograph was taken in the early 1900s. I still haven't come to a conclusion when it was taken, but perhaps a discussion of other items in the photograph may help in this regard. The shop window contains a myriad of interesting items on display, some of which are easy to identify. Rather than presenting readers of this blog with a fait accompli, I thought it might be interesting to open up the task of identifying as many articles as possible, a form of what The Economist recently referred to as crowdsourcing. Although this concept is not new - it was used in the 19th Century to compile the Oxford English Dictionary - the term was first coined in 2006 (Howe) to describe a process which harvests the talents of an undefined group of people, generally via the internet, to perform a task traditionally carried out by an employee or contractor. This is much along the lines of what I have inadvertently achieved on Derbyshire Photographers over the last six years, with hundreds of contributions from family historians and photograph collectors all over the world. So if you would like to participate in this mini-crowdsourcing experiment, please feel free to download the high resolution version of the image here (but be careful it is over 3MB). I'm looking for a comprehensive list of all the items that can be identified in the shop window, in the doorway, on the pavement in front of the shop, on the walls, etc. If you know, or can find by researching, any interesting details to add about the items, or contemporary (i.e. from that era, not this one) images of similar items, so much the better. Please feel free to either post as comments or by email. I will post the results of our combined analysis as Part 2 of this post in due course, and will include acknowledgements to all who participate. I am, of course, hoping that there will be some further clues unearthed which may help to narrow the dates. However, even if we don't manage that, it will be an interesting exercise in the powers of our observation. Good luck and thank you. Howe, Jeff (2006) The Rise of Crowdsourcing, in Wired, Issue 14.06 June 2006. In April I posted an article with images of a large group photograph (shown above) of some 250 odd members of the Royal Air Force Volunteer Reserve, taken by W.W. Winter Ltd. in 1939 at Highfields, near Derby. Peter Kirk, Peter Felix and Nigel Aspdin provided details the location and date of the photograph, as well as information about one of the men in the photo, whih was discussed in a later update. I recently received an email from Paul McLocklin of Derby with some interesting information about another airman in the photograph. Apart from the general historical significance and interest in the picture I have a slightly more personal interest relating to an individual who is featured on image 5 bottom row 3rd from the right. His name was James Frances Bassett and he and his family were friends of my father and grandparents. His career in the RAF was fairly exceptional in that he completed two operational tours as an Observer/Navigator and was awarded both the DFM and DFC. Not being allowed to embark on another tour as an Observer he retrained as a Bomber pilot and flew heavy bombers in India. After the war he moved to Canada and then to America where he remained until his passing last year. He was a truly exceptional man. I hope this is of interest to you and offers a small insight in to one of the men featured on the photograph. Jim also had a copy of this photograph and poignantly remarked that virtually all of those personnel were lost during the war. Many thanks to Paul for getting in touch and for the information he has provided. Diana Burns has an old album containing a number of portraits of ship's captains. Most appear to be Scottish, although the photographs were mostly taken at studios in San Francisco (California, United States). I will be featuring some of these portraits over the next few weeks, in the hope that some reader may eventually be able to add to the little information we have been able to garner about the seafarers and the ships they captained. The first cabinet card is a full-length portrait of an unidentified man with moustache and side whiskers, dressed in a double-breasted coat with markings on the cuffs suggesting that he was a ship's officer of some sort. Unfortunately, his ship's name is not recorded. The studio setting is fairly basic, comprising a plain unpainted backdrop, a standard diamond-pattern carpet, and a rather ornate studio chair. The card mount has rounded corners, andf I believe that it was probably taken in the mid-1870s. The reverse of the card mount shows the studio name of Hippolyte Arnoux of Port Said, which was in Egypt, at the northern end of the Suez Canal. Arnoux made his reputation as a photographer documenting the excavation and construction of the Suez Canal between 1859 and 1869, publishing the photographs as the Album du Canal de Suez, which is advertised on the reverse of the card mount. Also pictured on the reverse is a representation of one of the dredges used in the exavation of the canal, similar to that pictured in an albumen print published by Arnoux and shown below. Although Arnoux is best remembered for his views of the canal development, he was also a portrait photographer, having a studio at the Place Ferdinand de Lesseps in Port Said, and a dark room housed on a boat moored on the canal. He produced commercial photographs of ancient Egyptian monuments and Cairo buildings, as well as local types and ethnographic portraits, such as the Arabian Knife Grinder and his Client, the Water Carrier, the Arabian Barber, Jewish Woman, Turkish Woman and Arabian Dancer, which were popular with tourists and other travellers. It is believed that he travelled extensively in Aden, Jerusalem, Sudan, Somalia and Ethiopia, taking photographs for sale. He was for a time in partnership with other Port Said photographers, including the Zangaki brothers, George and Constantine, and Antonio Beato. He operated until at least 1890. In a previous article I featured a class photograph at St James' Board School of New Normanton, near Derby, taken between 1898 and 1900, which included my grandfather Charles Leslie Lionel Payne (1892-1975). I have since discovered another class photograph in the family collection which, although it is not marked thus, I believe must have been taken at the same school, but almost two decades earlier. The class photo shows a group of 43 boys, aged about 9 to 13, and two masters. I believe I can identify my great-grandfather Charles Vincent Payne (1868-1951), seated in the front row, third from right, and his younger brother Charles Hallam Payne (1870-1960), in the middle row, fourth from left. They look to be aged about thirteen and eleven respectively which, if I am correct, suggests a date of around 1881-1882. I featured another class photograph of Charles Vincent in an earlier Photo-Sleuth article, taken c. 1877 at St Andrew's Middle Class School, Litchurch. The Board School was built in 1879, and the Payne family returned from an American sojourn in late 1880 or early 1881, so the 1881-1882 date fits the family circumstances well. The reverse of the cabinet card mount bears the mark of Erasmus Bostock of Derby, a photographer who specialised in schools. Hilary Booth recently got in touch with me after reading the article, "I have two similar photos in my possession and wondered if you would like to see them." Francis Richard Porter (seated second from the left, in the second row from the front) was the son of Francis and Mary Porter who lived on Dale Road, Derby. Mary Porter ran a shop, converted in the front room of her house, number 66, while Francis was a waggoner at a brewery. This must have been taken just before Francis Richard died aged 6. I can't make out the reading on the board but I know it was St James Road School as my grandmother told me. Francis and Mary's Children were Harriet, Emily, Francis, Herbert and my grandmother Sarah Alice. From my research of census records (Source: Ancestry) and the FreeBMD index of birth and death records, I was able to determine that Francis Richard Porter was born at Derby in late 1887 or early 1888, and died there 1894. From the back stamp on the card mount, it appears that the class photo was taken by R.K. Peacock (1844-1893) of The Spot Studio, St Peter's Street, Derby. Previous research presented in my profile of this photographer shows him to have occupied these premises from c. 1889 until his death in late 1893. Unfortunately, the text written on the slate is very indistinct. With digital enhancement I was able to decipher some of it - perhaps, "St. James' Rd. Bd. School," but the last line is illegible. However, I believe that it must have been taken just before Francis Richard Porter's death, probably in early to mid-1893. The windows and brickwork in the photograph appear very similar to those in the previously posted class photo, taken about 5-7 years later. The second picture is of a young Herbert Porter (second from the right, in the top row), about ten years old. He was also the son of Francis and Mary, born in 1891. This picture clearly says that it was taken in 1901. Herbert died in 1932 aged 41. My enhanced version of this slate is much clearer, showing the following text: "St James Road Board School, Stand V, July 4th 1901." Herbert Henry Porter (1890-1932) is shown aged ten in the 1901 Census, which was taken on 31 March. My mother Vera also attended St James School, which later went on to become called Hardwick School. My sister Annette and I both attended Hardwick Junior School for girls and Hardwick Secondary School. We lived and grew up in the area and were obviously very familiar with the school and the surrounding area. Just before the school closed for demolition they had an 'open day' where old school members were allowed to go round the building and contribute to memorabilia which was posted around the school. It was a lovely trip down memory lane. Many thanks to Hilary for her contributions of images and memories. When I was scanning a collection of old family photographs at my aunt's house in Derbyshire last year, I came across a photograph which didn't appear to be of a known family member. I didn't have an opportunity to have a good look at it then, but scanned it at a fairly high resolution (600 dpi) so that I could investigate it further at a later stage. Well, I've now had that opportunity, and have decided to share it here because I think it is a good demonstration of how documentary, as well as photographic, sources can be used to help in the identification process. It's also a story worth relating. The photograph is a standard 134 x 85mm postcard with a divided back. It shows a young man, in uniform and with his cap in hand, kneeling next to two graves, both with cross-shaped grave markers, in a cemetery which is somewhat overgrown with weeds. More grave markers are visible in the background, as are several wooden fences and a line of trees. Enlargement of the detail of the crosses shows enough of the writing to make out the soldiers' names. I have used the Debt of Honour database of the Commonwealth War Graves Commission (CWGC) to identify the soldiers, and the Library & Archives of Canada two online databases, War Diaries of the First World War and Soldiers of the First World War to find out more about them and the events leading up to their deaths. George Pigrum Bowie was born in Upper Holloway, London on 29 March 1881, and was the eldest son of a clerk in the civil service. The 1911 Census shows him living in Vancouver and working as an architect. Presumably he was also a Freemason. At the time of his enlistment at Valcartier in September 1914, he had already served for three years with the 20th Middlesex Rifles, and was an active member of the 31st British Columbia Horse, a militia regiment. His attestation paper shows that he was granted a temporary commission. The CWCG database entry confirms his date of death, give his age as 34 and states that he was serving with "A" Company, 5th Battalion at the time. It also states that his grave lies in Plot III. D. 10. of the Berks Cemetery Extension, located 12.5 kilometres south of Ieper (Ypres) town centre, 3 kilometres beyond Mesen (Messines) and opposite Hyde Park Corner Royal Berks Cemetery. These two cemeteries lie between Ploegsteert Wood (Bois de Ploegsteert) and Bois de la Hutte. Examination of the 5th C.I.Bn. War Diaries for that period show them to have been in the forward trenches. 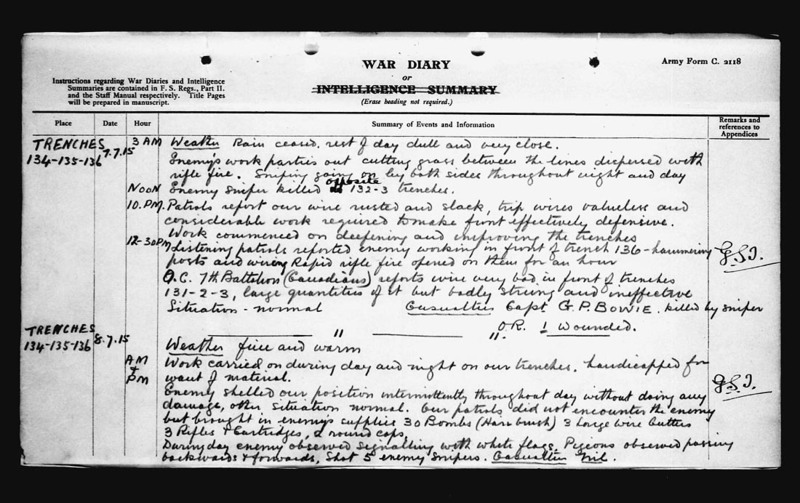 The entry for 7th July refers to work being done to deepen and improve trenches, the need for refurbishment of the wire in no-man's-land, the dispersal of enemy working parties with rifle fire, and trouble with enemy snipers, including the killing of Capt. C.P. Bowie by a sniper's bullet. There is more text around the lower edges, but it is difficult to make out. Albert Gustave E. Gabbe was born on 11 October 1891 at Dover, Kent, where his parents were hotelkeepers. He also enlisted at Valcartier on 24 September 1914, having previously served for 3½ years with the Royal Field Artillery. The CWGC database also has 30 August 1915 as his date of death, but provides no further information apart from his plot number, III. D. 9., also in the Berks Cemetery Extension. The War Diary entry for that day only shows, "Casualties:- 1 killed, 1 wounded." United Kingdom Lance Corporal 2244 Seaforth Highlanders 02/04/1915 Age: 23 III. C. 28. Son of William and Alice Maud Macfarlane, of Lewisham, London. Born at Dingwall, Ross-shire. Unfortunately, the name on the cross behind Macfarlane's is just too difficult to decipher. The extension was begun in June 1916 and used continuously until September 1917. At the Armistice, the extension comprised Plot I only, but Plots II and III were added in 1930 when graves were brought in from Rosenberg Chateau Military Cemetery and Extension, about 1 kilometre to the north-west, when it was established that these sites could not be acquired in perpetuity. Rosenberg Chateau Military Cemetery was used by fighting units from November 1914 to August 1916. The extension was begun in May 1916 and used until March 1918. Together, the cemetery and extension were sometimes referred to as 'Red Lodge'. ... the Rosenburg Chateau Military Cemetery and Extension stood in the grounds of the chateau of that name, and the owner felt that, as he rebuilt his house, the cemetery would stand too close to it. Despite pleas from the British and Belgian authorities, he remained firm, and eventually the 475 men buried there were exhumed and moved the half mile distance to this, their final resting place. In March 1930 The Times reported that "each body, as it was reverently taken from the earth, was placed in a coffin draped with the Union Jack and removed by motor ambulance to the Royal Berkshire Cemetery Extension". Thanks to Alan's reference, I was able to find the image of the article very easily in the Online Newspaper Archive of The Times from 1785-1985. A transcript of the full article is provided here. This extract of a 1:40,000 Ordnance Survey map of Belgium and Part of France (Sheet 28, Edition 3, published in February 1917 from data corrected to 23-12-16) shows the western part of Ploegsteert Wood, now commonly referred to as Bois de la Hutte. The area now occupied by the Berks Cemetery Extension is situated immediate to the south-west of Hyde Park Corner. Red Lodge is shown approximately a kilometre (each square has sides of 1000 yds, which approximates to a kilometre) to the north-west of Hyde Park Corner. This is roughly in the area that Alan Jennings' map refers to as the "Report Centre," now consisting of a large concrete structure which he believes may have been the entrance to the "Catacombs," beneath Hill 63. Immediately to the north of the "o" of "Red Lodge" on the OS map is a rectangular plot which I believe may have been the Rosenberg Chateau Military Cemetery and Extension. On the reverse there is little of much use in the identification - only the words, "CANADIAN WAR GRAVES BELGIUM" written in ink, in my aunt's handwriting. My grandfather Leslie Payne (1892-1975) served in the Canadian Expeditionary Force (CEF) during the Great War, so it seemed very likely that the photograph had something to do with his war service. One of the gravestones has what appears to be a Canadian maple leaf, the emblem of the CEF, at the top. The soldier in the picture was definitely not my grandfather, but he looked familiar. After some deliberation I realized that I had seen him in another photograph belonging to my grandfather, one of a group that had been passed down to my father. This snapshot of three soldiers seated outside a dugout or revetment fortified with corrugated iron and sandbags, accompanied a letter sent to Leslie Payne, then living in Derbyshire, England, by his friend Ed Pye in Ottawa, Ontario (Canada). The letter is dated 26 June 1936 - in it my grandfather's old pal Ed recalls making, "... in the summer of 1916, occasional visits from Ploegsteert to your camp east of Bailleul" and refers to the snapshot thus, "Have dug out another war photo taken in 1915; Hill 63, Ploegsteert Wood, you may recognize the Clown Prince at left." The clown prince was, of course, Ed himself, confirmed by another photograph I found illustrating an article which he had written for the Legionary magazine. This clearly shows his C/5 collar tag which shows that he served with the 5th Canadian Infantry Battalion. A few years ago, learning that Ed Pye had been a friend of my grandfather's since they worked together for the CPR in Saskatchewan before the war, and then throughout the war, I ordered Ed Pye's full CEF Service Records from the Library & Archives of Canada. From these, I was able to piece together an outline of his movements during the war. Subsequently, I have also been in touch with Ed's son Brian Pye and grandson Robert Edge, who have kindly provided further information. Arthur Edwin Pye (1893-1960) originally enlisted in the 60th Rifles at Moose Jaw, Saskatchewan on 12 August 1914, and five weeks later was attested into the 11th Battalion at Valcartier. He sailed over to England from Canada with the First Contingent on the SS Royal Edward in October 1914. After training, during which time he was transferred to the 5th Canadian Battalion (Western Cavalry), he went over to France in February 1915, being sent straight to the front as part of the First Canadian Division. He was wounded in March 1916, and spent some time at No. 1 Convalescent Depot in Boulogne, but appears to he recovered sufficiently to have been sent back to the front again after some time at "Base". He probably spent much of summer 1916 at the front - the service records only show that he was promoted twice in June - but was wounded for a second time on the Somme at the Battle of Flers-Courcelette on 26 September, which got him his "Blighty". I believe, therefore, that this photograph must have been taken in the spring or summer of 1916. I presume that Ed Pye visited and had his photo taken next to these particular graves because they were of men that he had served with the previous year. I don't know if they had particular relevance to my grandfather. If the deceased soldiers were living in Saskatchewan prior to their enlistment in the CEF, then I suppose it is possible he knew them. However, it's more likely that Ed sent the postcard to him as a photograph of himself, rather than of the graves.